A Los Alamos Landmark, The 'Black Hole,' Is About To Disappear : The Two-Way "Atomic Ed" Grothus spent his life collecting surplus equipment from the nation's foremost nuclear weapons lab — the Department of Energy's Los Alamos National Laboratory. He died in 2009. Now his family is holding a liquidation sale. 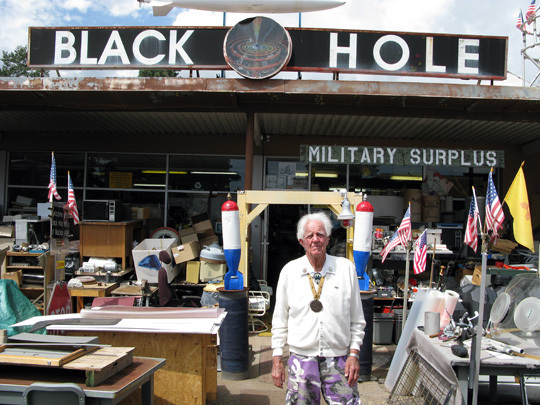 "Atomic Ed" Grothus at the Black Hole surplus story in Los Alamos, N.M., in 2008. It's called the Black Hole because "everything goes in and nothing comes out," as founder Ed Grothus told NPR's John Burnett in 2008. But now, after the death of "Atomic Ed" in 2009 and his wife Margaret's passing in March of this year, what has been one of the weirdest government surplus stores in the nation (and Los Alamos' second-most visited tourist attraction), is closing. A liquidation sale is set for Friday through Sunday. Grothus' "cluttered, five-acre compound," as John described it, has since its opening in 1980 offered for sale surplus from "the nation's foremost nuclear weapons lab — the Department of Energy's Los Alamos National Laboratory" in New Mexico. Grothus had "everything — from oscilloscopes and galvanometers to Geiger counters and centrifuges — stacked in canyons in the Black Hole." The "featured items" in the Black Hole's inventory include a 6,000-gallon capacity "cryogenic dewar" that was manufactured to store helium but never got used. Asking price: $18,000 or best offer." The store's broader list of items for sale includes: flow gauges, a greenhouse, movie props, rodent cages, typwriters and vacuum tubes. A "famous peacenik," as John dubbed him, Grothus once worked at the Los Alamos lab — but quit in 1969 "over his opposition to the Vietnam War." In the years from then until his death, he combined his profession with his passion: "Every August, in remembrance of the atomic bombs dropped on Japan," John reported for Morning Edition, Grothus would join "out-of-town peaceniks and unfurl a large banner that said, 'WE APOLOGIZE FOR THE NUCLEAR BOMB.' His letters about nuclear disarmament appear in the local newspaper every few weeks." Now though, daughter Barbara Grothus says in a statement sent to reporters, "it is time for us to focus on our own lives and families. We are sad of course, but we look forward to the change this will bring." Whether much of the inventory will sell, though, is uncertain. As Grothus conceded back in 2008, the store's name was apt because so little of what he collected — maybe 1 percent — actually got sold to someone else. The stuff just disappeared into the Black Hole.